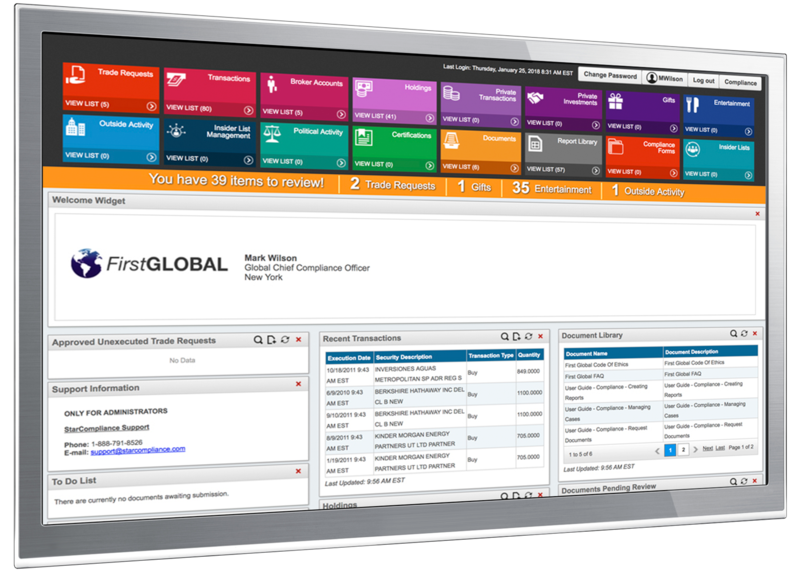 and monitor your firm's most important information flows from a single platform. A control room is the nerve center of any global enterprise financial firm. The nexus through which all critical deal-related data and communications must pass to be organized and assessed. Many firms still use rudimentary systems, built around spreadsheets and email, to manage this complex set of tasks. 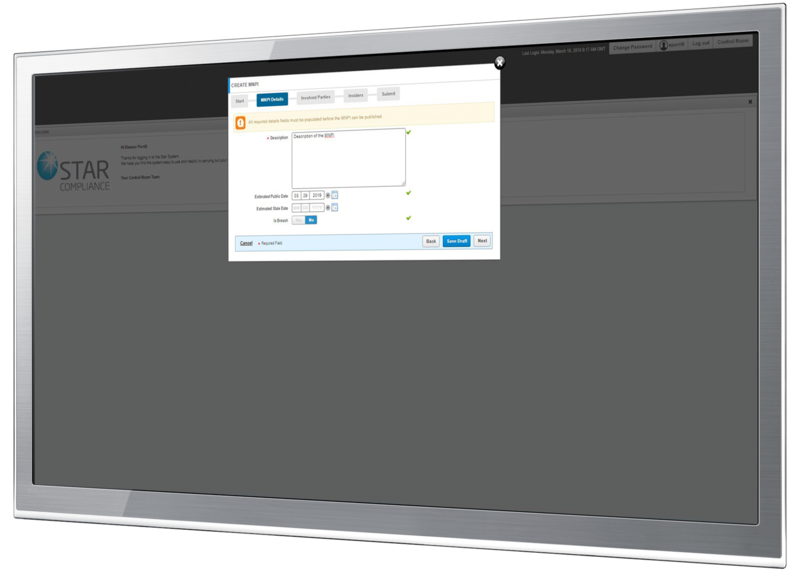 Compliance Control Room's enterprise-level single platform centralizes all your firm's deal-related activity—letting you manage control room activities more efficiently and effectively, and in the process reduce risk and ensure that firm processes stand up to internal and external audit requirements. Control room teams may manage thousands of deals simultaneously, with each needing its own level of attention and pacing. Compliance Control Room gives teams the complete data-picture they need to keep pace with, and stay one step ahead of, this volume of activity. Your analysts get a consolidated view of a deal as it progresses through the deal lifecycle. They can request, record, and review all deal-related information, including involved parties, wall crossings, and conflict-clearance results. Compliance Control Room is built with global enterprise financial firms in mind, which means timely communication between stakeholders is crucial. 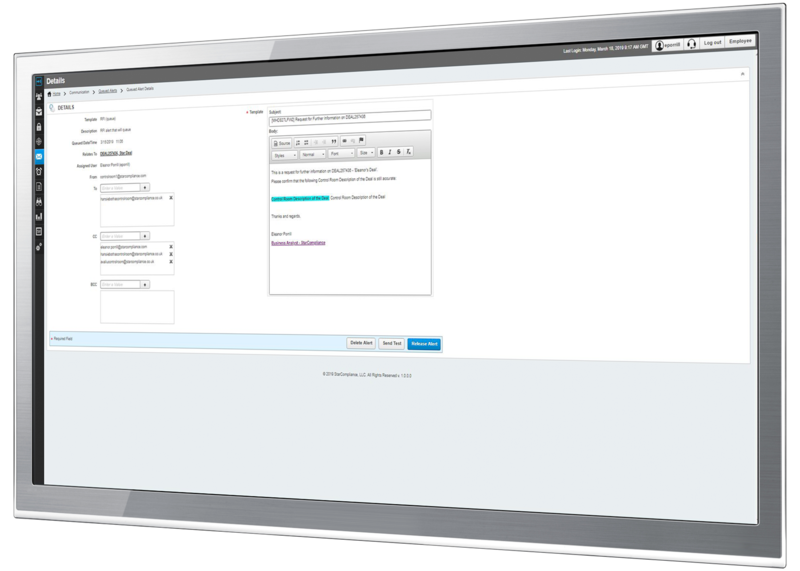 Star’s intuitive single platform gives deal owners, deal-team members, control-room teams, and compliance leadership one, centralized place to provide deal updates, view key information, and initiate workflow requests. No matter where in the world they are. 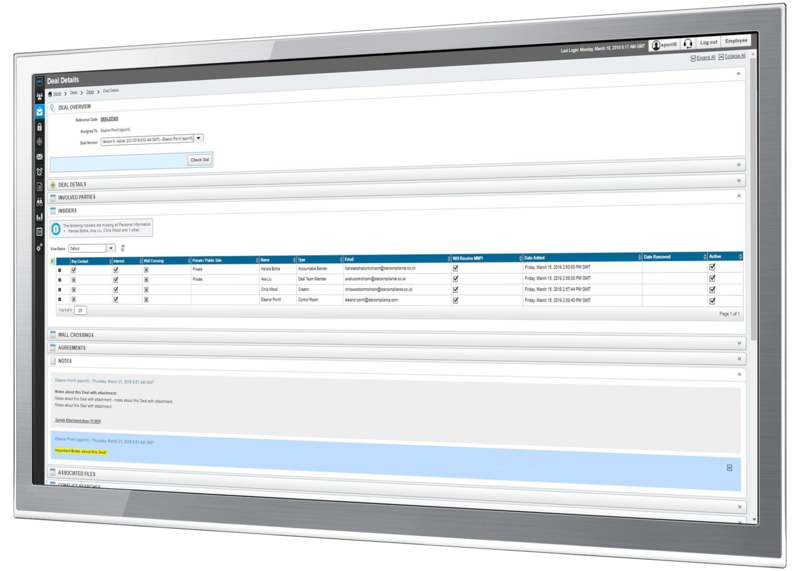 Compliance Control Room integrates easily with all your existing firm systems, including deal management, order management, human resources, and research. It also integrates with the external apps your firm depends on. More and more, tech is about enterprise apps collaborating with each other, and Compliance Control Room embraces this modern IT ethos. And used in concert with Star's employee conflicts monitoring suite, Compliance Control Room gives your control room team an even wider view of firm activity. Material Non-Public Information can originate on the public side as well as the private side of an enterprise financial firm, and must be diligently tracked by the control room team regardless of where it came from. 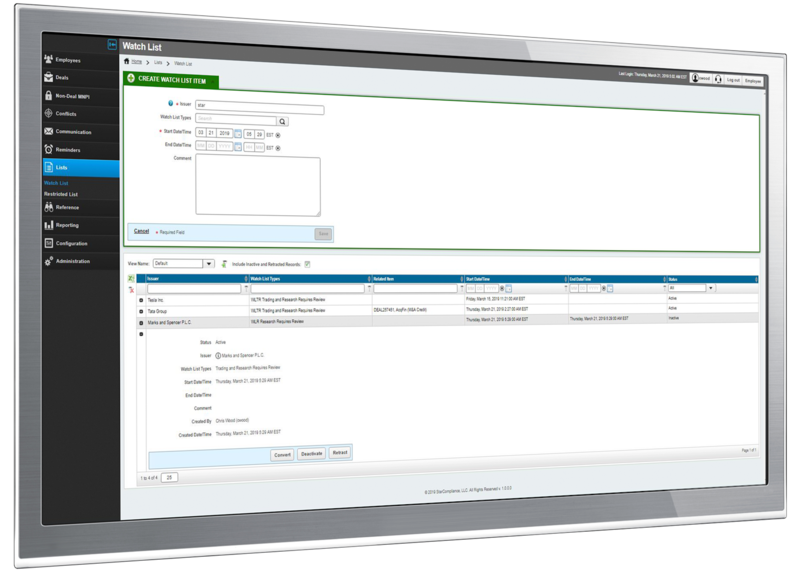 Compliance Control Room takes on this monitoring challenge with an instant, firm-wide MNPI reporting capability. Built around an employee portal, it allows people anywhere in the company to report receipt of MNPI—ensuring that the activity makes its way to the control room team and the appropriate action is taken. Having thousands of deals in motion is a good thing, so long as you can keep track of all the securities that can or can't be traded as a result of potential conflicts. Compliance Control Room offers comprehensive watch and restricted list management capabilities to ensure individual employees and the firm overall remain compliant. Control room teams can associate entries down to the project level and type of required restriction, as well as publish watch lists or restricted lists to downstream systems. Designed into the application from the start, Compliance Control Room's auditing and reporting suite is incredibly comprehensive. 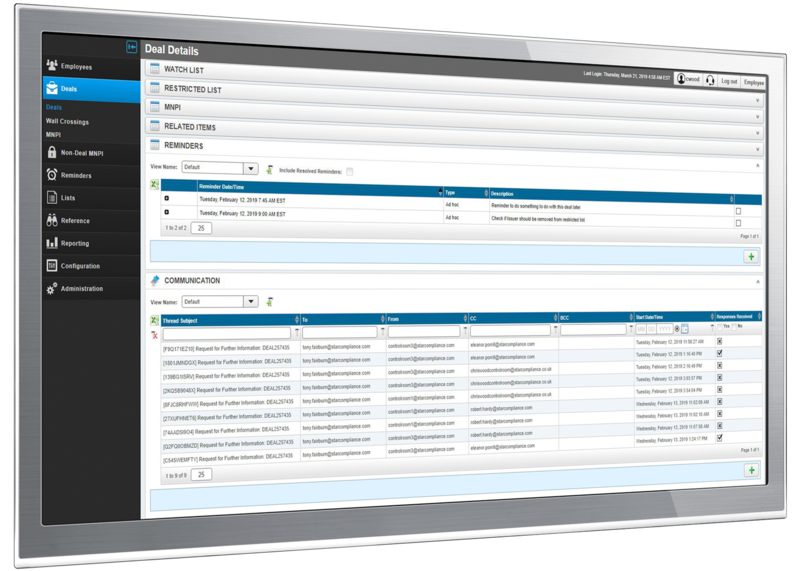 It maintains a detailed audit trail for every creation, change, or deletion event against a deal. It generates meaningful management information and insightful analytics on every key aspect of deal activity, including conflicts, breaches, and resolutions. And Compliance Control Room is always audit ready—whether internal or external, and at any point in the deal lifecycle. Learn More. Schedule Your Demo Today! Making compliance simple and easy is Star's mission. Compliance Control Room collects and organizes deal-related information from across your firm and gives you the tools to quickly and confidently assess it. Reducing risk. Improving efficiency. Growing your business. That's your mission. Made simpler and easier with Star.